In simple words, content curation is collection of all contents relating to one topic. You know, today internet is so big. No one has time to read all contents which is searched on Google. Moreover google is search engine not the collector of all contents relating to your topic on the basis of popularity in the world. This collection of content has been done on the basis of different method. For example, any topic's all contents can be collected on the basis of its popularity on internet. Second, contents curation can be done on the basis of social sharing, social liking and social voting. Now you can understand easy, there are three parties in content curation. For example, I am only content creator. I create my content for sharing my knowledge. Anyone who will read will get free knowledge. Knowledge is power. If same content will popular in social media or internet, it is sure, it will come in the hand of content curators. There millions of readers who love to read the contents of content curation websites. Now, content will go viral and its million of content users will read my content and it will identify in world level. Second example, I have oldest coin. I can see it to my friend circle and feel happy. But If give it to world famous museum, it will be seen by public on the ticket. So, content curators are just like museum. If you are content creator or content user, content curators will help you to find best contents relating to your topic. Following are main content curators. 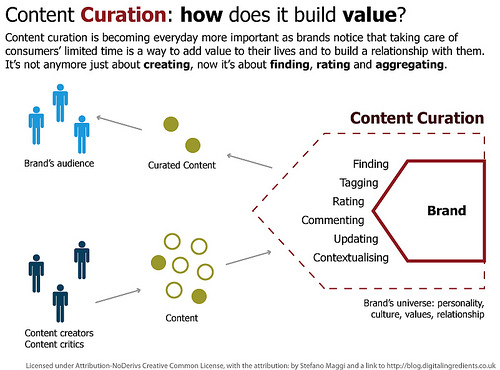 Content curation is not content creation. It is just discovering and keeping in showroom of past created great contents. But content creation is the process of creating new contents. If you want to viral your content, you need content curation. In the social media, if you use content curation strategy, you can get big traffic for your site or blog. It is the art of collecting and sharing contents in one place relating to your topic. It is not the collection of all contents and its links. For example, you love to see the clothes with press and keep in the organised place. One side will be ti-shirt. One side will be the paints. One side will be the lady suits. That will be great. Content curation is just like this. With content curation tools, you can find different tools for content finding on one place like RSS feeds, social media accounts and websites. No Comment to " Content Curation Simplified "